Will you be able to spare an hour or two on Saturday 14th November to help us plant 3,200 bulbs on Tiverton Green? In the last eight years there have been many trees planted on Tiverton Green – willows and cherry blossom in particular. A number of fruit trees, planted in 2013, had to be removed for the Thames Water excavation works but are now going to be replaced. In addition to the orchard planting, Thames Water’s budget stretched to providing 3,200 daffodil bulbs, which will provide a glorious carpet of colour in the early Spring. 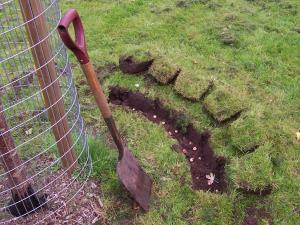 But we need volunteers – lots of you – armed with spades and trowels, to help get these into the ground. Please bring your kids, garden gloves and tools and join us at 9am on Saturday 14th November.